Monty had contacted us a few months back getting some pricing details to create an eCommerce store, Sports Collectors Galaxy. He sells thousands of sports cards on eBay currently – but wanted to also branch out and make his own eCommerce web store to save the cost on some fees and to put his collection on. Eventually, Monty notes that he will have millions of sports cards available for purchase on his website. Once Monty was ready to get started, we got to work right away and had his website completed within just a week! He chose us as his full-service website provider and also had us register and manage his domain name and provide the website hosting. He also chose some additional functionality – such as the ability to import all of his product names, prices, and quantities from a “CSV” file. With as many cards as Monty has, it would have been too time consuming to use the website system to create the products. By using the import utility, he can import a large file that would take substantially less time to add. We appreciate the business from Monty and he has already let us know that there will be at least two other individuals he knows that will want a website similar to his. He just wanted to confirm that we were reputable and easy to work with before passing along his referrals to us. Thank you for the opportunity to create an eCommerce web store for you and your business, Monty! 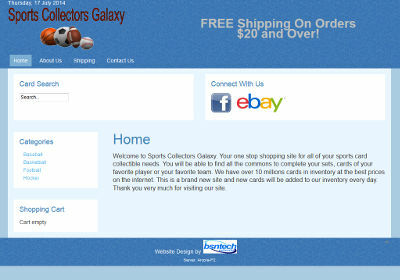 The Sports Collectors Galaxy website is at sportscollectorsgalaxy.com.